Paris's RER trains take a bit of learning. Read this page before you ride an RER train in Paris, and you'll save yourself lots of confusion and time. 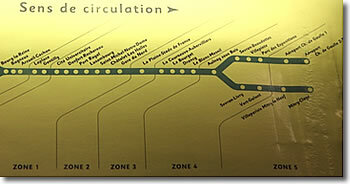 RER fares are based on zones. Tell the ticket agent your destination and say "EHR-uh-EHR" (RER). "One-way/single" is Aller simple (AH-ley SAM-pluh); round-trip/return is Aller-retour (AH-leh ruh-TOOR). Keep your ticket, as you will need it to exit the station at the end of your journey. Also, if you're traveling from central Paris to an airport (Orly or Charles de Gaulle), buy your RER ticket before beginning your journey. 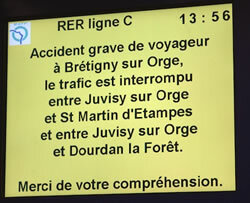 Read this warning about difficulty passing from the Métro to the RER at some stations! The 4-letter train codes (see photo to the right—>) are used on the printed train schedules posted in each station, and monitors and electronic signs show the code of the train that will be departing from that platform. 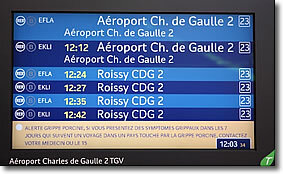 On the sign above, illuminated squares to the left of each station name show that this train stops at GARE DU NORD and six other stations before reaching MITRY-CLAYE, but it does not stop at AEROPORT CH. DE GAULLE 1 or 2 or six other stations. Remember to keep your RER ticket until you are outside your arrival station—you will need your ticket to exit the station! 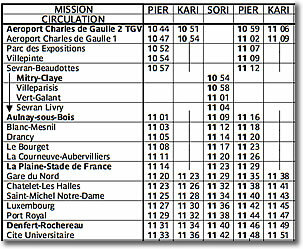 Above, portion of an RER train schedule. Note the 4-letter codes (PIER, KARI, etc. ), and how each train serves a different list of stations. 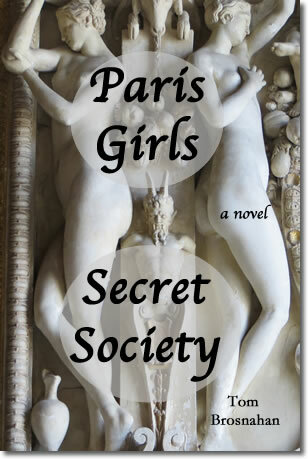 If the train code begins with K (as in KARI), the train is an express from CDG Airport to central Paris. KARI trains depart CDG seven minutes after PIER trains, but arrive at Châtelet- Les-Halles, in the center of Paris, only 3 minutes after PIER because they stop less. Above, cryptic 4-letter train code sign. The "E" means its destination is Aérogare 2 at Charles de Gaulle Airport. Monitors on the platform display information on delays and cancellations (in French only).